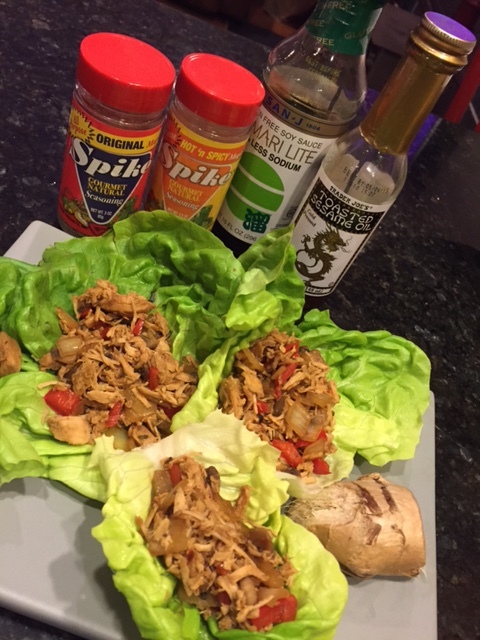 1 tsp Spike Gourmet Natural Seasoning, All Purpose, Hot ‘n Spicy Magic! Precook the chicken breasts by boiling them until they are fully cooked. I make the chicken in my slow cooker ahead of time and make this recipe with them cold. Dice the chicken. Chop the bell pepper and scallions. – set aside. Heat the sesame oil in a skillet and add the chicken, season with both flavors of Spike (don’t use the hot & spicy if you don’t like a little kick – they’re not hot, but flavor to taste) and soy sauce for 4 Tbs and add more if needed. Once combined, add the peppers and onions and cook until onions and peppers are soft. Grate the fresh ginger and mix well. Wash & dry the lettuce leaves, fill with a kitchen drawer tablespoon of filling and enjoy!